Abstract: Vein rare earth elements (REE) mineralization occurs in Early Paleozoic Rocks of the Gemeric Superunit. Quartz-apatite veins near Cucma village contain a significant concentration of xenotime-(Y) accompanied by monazite-(Ce), allanite-(Ce), goyazite, and plumbogummite. Less significant accumulation of disseminated xenotime and its veinlets is also known near Betliar, Helcmanovce and Kociha villages. Near Kociha crandallite (?) was also found with increased contents of REE. The REE mineralization is accompanied by apatite, uraninite, brannerite, autunite, torbernite, quartz, pyrite, turmaline, rutile, titanite, marcasite and goethite. The content of REE and Y reaches up to several tenths of one weight percent and rarely even more than 1 weight percent in veins near Cucma. The other occurrences show only moderately increased contents of REE and Y (from 0.1 to 0.8 weight percent). Phosphates associated with metamorphosed black sediments are considered to be a source of the REE mineralization. 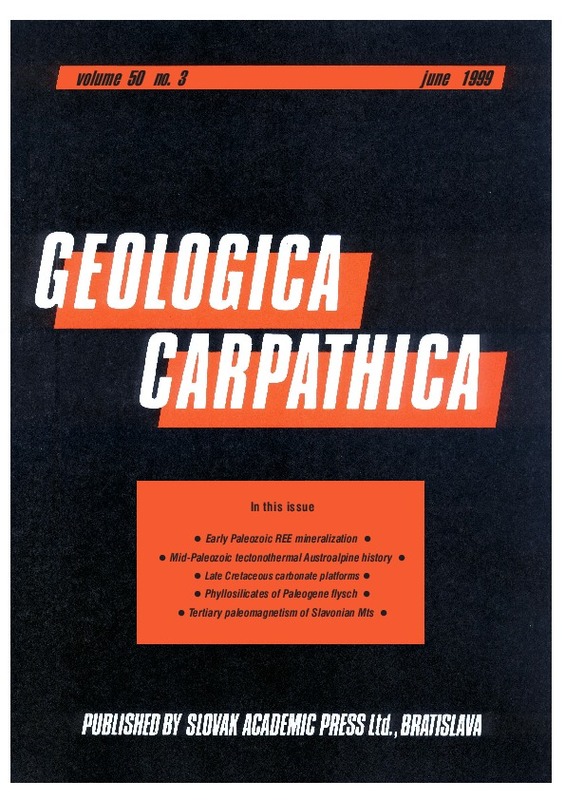 Abstract: 40Ar/39Ar mineral dating has been carried out within the amphibolite-facies metamorphic basement and greenschist-facies metamorphic cover of various tectonic units within the Kaintaleck nappe, Eastern Alps, Austria, to evaluate the age of pre-Alpine metamorphism. Hornblendes display discordant 40Ar/39Ar apparent age spectra, minimum ages recorded in medium- to high-temperature gas release steps are ca. 430–405 Ma. White mica from micaschist record discordant 40Ar/39Ar age spectra with ages of ca. 350–379 Ma in medium- and high-temperature increments. White mica from discordant aplite and pegmatite record 40Ar/39Ar plateau ages of 375.4 ± 0.4 Ma and 364.0 ± 0.8 Ma respectively. The new isotopic ages indicate that (1) mid-Paleozoic (e.g. 430–380 Ma) tectonometamorphic activity is recorded within the basement of the Kaintaleck Nappe; (2) this basement cannot represent the metamorphic basement for Ordovician to Late-Cretaceous sedimentary sequences of the Noric-Tirolic nappe complex (within uppermost units of the Austroalpine nappe complex); (3) the tectonometamorphic evolution of this basement unit contrasts with that of other basement units exposed in the Eastern Alps, where predominantly "late Variscan" (e.g. 330–300 Ma) tectonometamorphic events are recorded in Silurian to Early Carboniferous passive continental margin sequences; and therefore (4) at least two contrasting terranes comprise the Austroalpine basement. Abstract: Upper Cretaceous rudist platform and slope deposits were studied in the Bakony Mountains. During the Turonian-Early Senonian tectogenesis an articulated basin came into being in the area of the Bakony; depressions and highs were formed roughly parallel with the structural strike of the mountain. Inundation of the highs led to the evolution of carbonate platforms. The studied platform was located in the inner part of the basin separating a southern and a northern sub-basin. Facies studies revealed that the architecture and evolution of the southern and the northern slope of the asymmetrical platform were fundamentally different. A steep erosional slope bounded the platform to the south with lithoclast accumulation at the toe of the slope, whereas a gentle accretional slope was developed northward. Evolution of the platform and the slopes was controlled mainly by two 3rd_ order relative sea level changes on which higher order oscillation of the sea level was superimposed. Abstract: Trioctahedral clay minerals occurring as phyllosilicate cement in diagenetically altered serpentinitic graywackes have been studied using X-ray powder diffraction, scanning electron microscopy, and microprobe analyses. Two distinct cement assemblages were observed: (1) saponite ± calcite ± dolomite ± opal-CT ± pyrite, which is restricted to quartz-rich graywackes, and (2) ordered mixed-layered chlorite/smectite (C/S) + saponite ± calcite ± dolomite ± opal-CT ± pyrite characteristic of serpentinite-rich graywackes. Swelling properties as well as chemical analyses reveal a predominance of high-charge layers both in saponite and C/S. Saponite and C/S show a unique composition of 2:1 layers with respect to Si/(Si+Al) ratio. The decrease in Mg/(Mg+Fe) ratio from saponite to C/S with respect to the increasing AlIV content implies that Fe-Mg substitution was controlled by distortion of tetrahedral sheets caused by Si-Al substitution. The lack of correlation between whole-rock and phyllosilicate Mg/(Mg+Fe) ratios supports this interpretation. Textural as well as compositional evidences suggest that both saponite and C/S originated by the interaction of the sediment with pore-fluids during burial as direct precipitates. It is inferred that a different bulk rock composition, and consequently, a different chemistry of pore-fluids played an important role during authigenesis. Particularly, the availability of Al may have been a primary factor controlling whether saponite or C/S formed, while the role of Mg (or Mg/(Mg+Fe) ratio) as well as the role of temperature were only of secondary importance. Abstract: Five sedimentary localities (Ottnangian through lower Pannonian age) and one igneous site (K/Ar age 17 Ma) were studied paleomagnetically. Apart from one sedimentary locality, all yielded excellent or good paleomagnetic results, with declinations indicating counterclockwise (CCW) rotations. The declinations are between 300 and 340° and seem to vary in space and not in time. Since the youngest rock exhibiting CCW rotation is of lower Pannonian age, it is reasonable to connect the rotations to the "intra-Pannonian" or "Rhodanian" tectonic phase, i.e. the most marked and last Tertiary tectonic event manifested in thrusts and strike-slip movements in the south-western part of the Tisza (Tisia) or South Pannonian megatectonic unit. The new paleomagnetic results are in harmony with CCW rotations postulated for the Slavonian Mts. However, the Tertiary paleomagnetic data from the Slavonian Mts. and the Mecsek Mts. point to extreme mobility within the south-west part of the Tisza megatectonic unit. This seems to be in conflict with current tectonic models which suppose a rigid Tisza megatectonic unit in the Tertiary.